The sun was going down and the sky was the color of ripe pumpkin with slashes of phosphorescent pink. It was beautiful and even the clutter of billboards up and down the strip looked beautiful to me. I was back out on the balcony, trying to think, trying to figure things out, waiting for Bledsoe to call back. He was the one who had left the message while I talked to Rachel. His message said he was out of the office but he would call back. I looked at the Marlboro Man, his crinkled eyes and stoic chin unchanged by time. He'd always been one of my heroes, an icon, no matter that he was always as shallow as a magazine page or a billboard sign. I remembered being at the dinner table, my position every night always to my father's right. Him always smoking and the ashtray always to the right of his plate. Me learning to smoke by virtue of that. 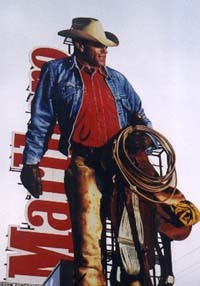 He looked like the Marlboro Man to me, my father. Back then, at least.